Acclaimed conductor, composer, and conducting teacher Peter Fender shares his passion for music with audiences and orchestras in his native England and beyond. Combining deep musical sensitivity, a strong stage presence, great motivational and communication skills, and a fine sense of humour he is becoming more and more in demand. He is currently Musical Director of Philharmonia Britannica and the Angel Orchestra in London, Mid Sussex Sinfonia in Sussex, and Opera Nova in Kent. He has conducted a number of other orchestras and groups in the UK, Italy, Bulgaria, and Romania. Peter’s musical career began as a violinist and violist. He has played principally with period instrument groups such as the Academy of Ancient Music, the London Classical Players, the Consort of Musicke and The Sixteen. He has been leader for many concerts, and directed a good number from the violin to boot. In 2006 his focus changed to conducting and since then he has studied with Michael Rose (MBE), Achim Holub, and Peter Stark (from the TV series ‘Maestro’). He has participated in master classes in England, Italy, and Austria. In 2007 he formed the orchestra Philharmonia Britannica. One reason for this was to create an orchestra which would regularly work with other art forms. PB concerts have subsequently included mixing live orchestral music with actors, poets, dancers, painters, live video displays, and even the great classical comedian Rainer Hersch! Through this Peter has been looking to draw in people who wouldn’t be interested by a ‘straight’ classical concert, and also looking for some interesting syntheses and juxtapositions. He also seeks to remove the ‘high brow’ from classical orchestral concerts. To this end he often gives short explanations of the music, interspersed with humorous comments about composers, aiming to make the music of interest to those who have never attended a classical concert – as well as those who are seasoned concert goers. In addition to attempting to attract new audiences by mixing music with other art forms, Peter plans and performs children’s concert with Mid Sussex Sinfonia, the Angel Orchestra. 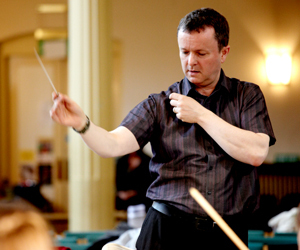 Peter teaches conducting on courses and workshops in London. There are courses for those new to conducting (including non-musicians), courses focusing on a great piece of music (e.g. Beethoven 9), and weekend workshops with orchestra for more experienced conductors. As a composer Peter has now written a variety of works for different sized groups. See the Compositions page for details. Peter strives to create music that is accessible to both players and audience but which are also compositionally interesting. A number of his orchestral works are on a CD released in 2012 - please visit the Sales page for more information. Scores are also available for perusal/hire. Peter has a blues harmonica which he hopes to learn one day!